Panorama locates information by scanning through the entire database looking for data that matches your criteria. The Find/Select dialog allows you to specify the criteria for locating information —- including the field (or fields) containing the data, the kind of match you want (contains, exact match, greater than, etc.) and the match value (the data you are looking for). To open this dialog, choose Find/Select from the Search menu. You can also click on the record count at the top of the window, or simply press Command-F.
By default the Find/Select dialog searches all fields in the database. Simply type in the word, phrase or name you want to search for. A preview of the search results appears immediately as you type. Here’s an example of a search for engineer. In this example engineer has been found in both the Organization and Title fields. To actually select a subset of the database, press the Select button. Panorama will scan through the entire database and select the records that match the criteria you have specified. The selected records remain visible, while the records that do not match temporarily vanish. Panorama displays the number of selected records in the center of the toolbar. 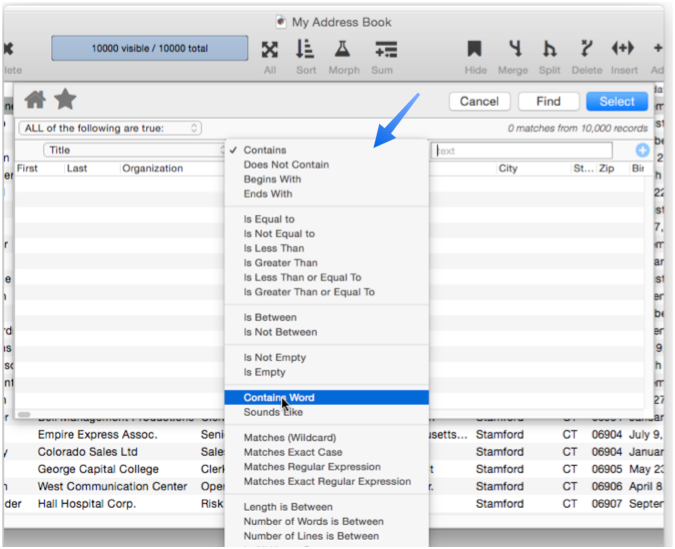 To restore the invisible records, choose the Select All command from the Search Menu (or click on the number of records in the tool bar, as shown below). To make a different selection, simply use Find/Select again. The original selection will vanish and the new selection will become visible. You do not need to choose Select All before selecting another subset. 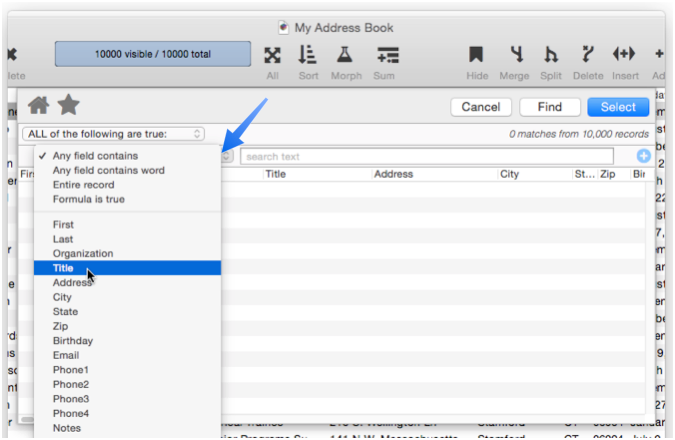 Another way to locate data is to “find” it (see Finding vs. Selecting on the Searching page). There are two ways to find a record from inside the Find/Select dialog -— either double click on it in the preview or press the Find button. Double clicking on a record in the preview closes the dialog and causes Panorama to jump to the actual record in the database. When you press the Find button, Panorama will go to the top of the database and start scanning. When Panorama finds a data cell that matches what you are looking for, it stops scanning and displays the information it has found. Panorama allows you to set up detailed criteria to narrow a search down to the exact information you are looking for. You’ve already seen the most general search, for text contained in any field, now we’ll look at how to narrow a search to more specific criteria. To search in a specific field instead of all fields, choose the field you want to search from the pop-up menu. Once you’ve selected a field you also have the option of selecting a comparison method for matching the data with the field. The matching options available will change depending on the type of field you have selected (text, number or date). To learn more about matching options, see Text Search Options, Numeric Search Options, and Date Search Options. Once you’ve selected the field and matching option you can type in the data you are looking for. The preview will update as you press each key. In this example the search done earlier has been narrowed to show only records where the job title contains engineer, instead of engineer being in any field. To search for multiple terms at once, press the + button at the far right end. This adds another row to the search criteria. In this example I’ve revised the search to show only engineers in Colorado. You can continue adding multiple search rows as necessary, for example here I’ve narrowed the search down to engineers in Colorado born before 1965. Once you’ve narrowed the search down to the subset you want you can press the Select or Find buttons to apply the search to the actual database. You can also save this search for later, see Favorite Searches. Normally when you specify multiple criteria they must all be true, in other words, each criteria is ANDed together. Using the pop-up menu at the top left of the dialog you can change how multiple criteria are combined. By changing this pop-up menu I can search for anyone who is either an engineer or a supervisor. Or, I can find anyone who is neither an engineer nor a supervisor. It’s possible to create a query that doesn’t make sense – for example asking Panorama to match all records with dates between a and b. When this happens Panorama will display a pink background behind the query line that doesn’t make sense, along with a red alert triangle. Click the red alert triangle to see the exact problem (in this case Illegal Date). To fix this problem, I would need to enter valid dates for the from and to options. If you want to repeat a search, hold down the Shift key when you open the Find/Select dialog. This will open the dialog with the previous search already set up. You can then modify the search or use it again as-is. Numeric Search Options -- searching numbers within a database. 10.0 Updated Carried over from Panorama 6.0, but with new sort dialog.